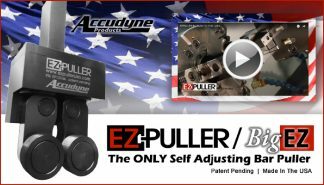 ACCUDYNE CORPORATION is introducing the EZ-PULLER. This self adjusting bar puller is used in CNC turning centers to provide semi-automatic operation of the machine. 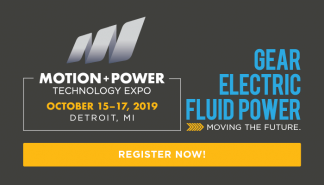 The design of the EZ-PULLER allows the programmer or set-up person to change bar sizes in the machine without having to manually adjust the tool. The tool functions by means of springs that provide force to pivoting arms. These arms in turn apply force to circular grippers at the end of the arms. The grippers rotate only under extreme load and have a unique serration geometry that generates minimal stock penetration while providing maximum grip for a more accurate pull. 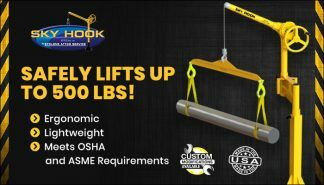 To set the tool for gripping and pulling bar stock, the tool is moved in the “Z” axis until the grippers are at least .150″ past the end of the stock, then moved in the “X” axis until the grippers are on centerline with the material being pulled. A standard pull cycle is then initiated.